I have hovered over this plant for months. It is an Artichoke thistle or Cardoon. Its scientific name is Cynara cardunculus. It may be a pest in some locations, so it is best not to let it set seed. I got it from my friend the fairy. It started out last fall in a three inch pot. It has spread out and reached up until it is taller than I am. 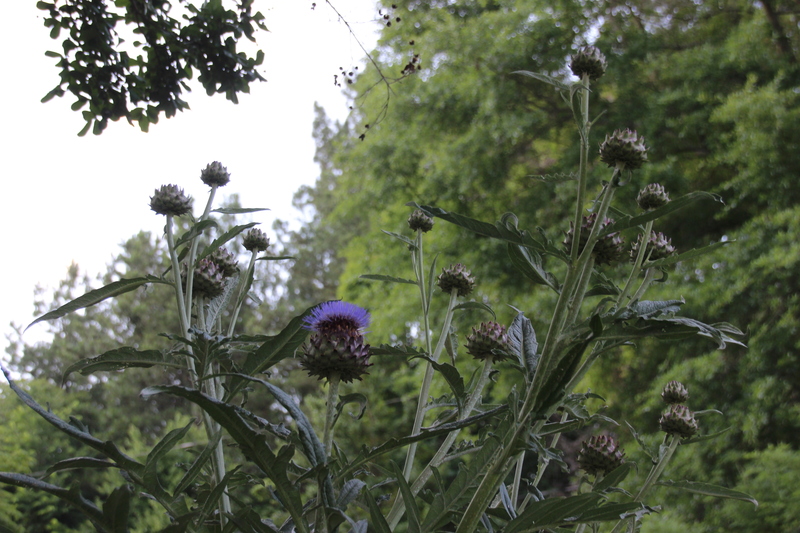 Now its artichoke-like blooms have sent up their purple tufts. The bees love the blooms as much as I do. The buds may be eaten like an artichoke. The stems may be eaten like celery after braising and/or steaming. Even the root can be boiled and eaten. I prefer to just feast on it with my eyes. I am proud of my giant baby.